Synopsis: A look at the lives and relationships among girls at an elite British boarding school. Review: One of the nice benefits to being a movie nerd is occasionally running across a movie you’ve never heard of before, seeing it, and feeling as if you’ve found a hidden gem. While reading reviews of Dark Shadows (admittedly to see how many times Michelle Pfeiffer was referred to) one reviewer mentioned Green and this indie UK film of hers from 2009. Describing the wacky witch she played in Dark Shadows as running parallel with the “unhinged” Miss G of Cracks my interest was piqued. Well, one InterLibrary Loan later (seriously, have you visited your library lately?) I had the movie at my disposal. I had originally planned to start it late at night and see how far I got…and 104 minutes later I turned it off as the credits ended. Cracks is one of those movies that has the potential to get under your skin and may require a few viewings to appreciate. Even seeing it once I don’t feel I caught everything that was presented…but what I did see I liked. Set in the woodsy countryside of the mid 20th century England, Cracks is the debut feature film for Scott (daughter of Prometheus director Ridley Scott and niece of Top Gun director Tony Scott). Daughter Scott evidentially has paid close attention to the work of her famous father and uncle (who also, incidentally are producers of this film) and turned in a visually strong and nuanced tale of misplaced intentions and the dark side of innocent obsession. Obsession is clearly the theme of the picture. Pecking order obsessed students are transfixed with teachers and vice versa, so much so that at one point nearly all of the parties involved are blindly following the object of their desires. The film opens with our introduction into the hierarchy of the boarding school, showing Di (Temple) clearly the alpha female of our group. She seems to be the classic teacher’s pet to the fascinating Miss G (Green) and the girls idolize her. There’s not much history of how the girls came to fall under her spell or why at a school that values obedience Miss G and her girls get a lot of leeway but it’s no matter. The audience is quickly invited into this inner group of privilege to witness what happens when a stranger is introduced into their mix. Fiamma (Valverde) is a Spanish immigrant of status that shows up halfway through the term and instantly becomes an adversary of Di. Without even trying, Fiamma catches the eye of Miss G and soon Di is yesterday’s news and plotting revenge on the lonely girl. Fiamma is no slouch, though, and challenges many of the accepted behaviors at the school, to the increasing chagrin of the group of mean girls. How it all plays out and the consequences that befall those involved is not totally unexpected but it’s one crisp journey that gave me a few shivers. 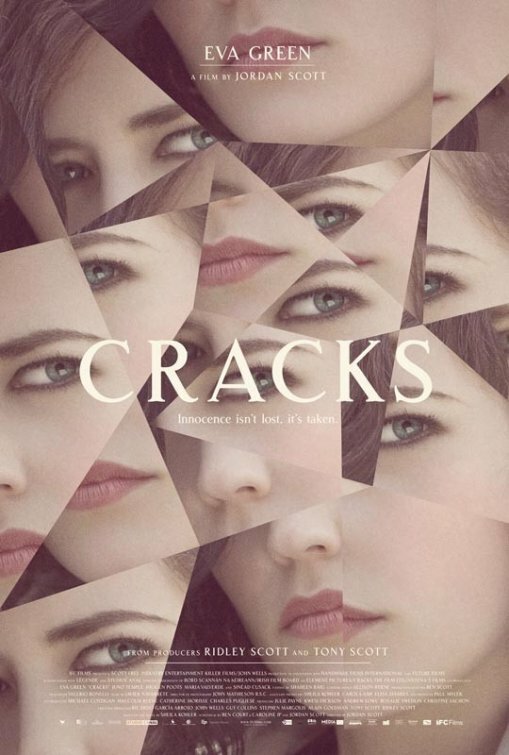 Cracks is not a horror, thriller, or Fatal Attraction-esque film…it’s too refined for that. It’s a psychological drama that chooses to spend its running time showing us these characters rather than simply have them speak everything they’re feeling. More is conveyed with lighting, music, and directional force than in expositional dialogue. It helps that the movie is stacked with a fine ensemble of females (with hardly a male figure in sight) who each carve out a place in the film that feels right. Heading the cast is Green, an actress that has made some interesting choices in her career. From Casino Royale Bond girl to previously mentioned Dark Shadows witch she is clearly attracted to women with a dark side that she can plumb the depths of. Miss G might be her darkest yet and an entire movie could have been made out of Green’s interpretation of the role. In a movie without any true heroines, you have to settle for the next best thing. Temple and Valverde both play flawed young ladies that have hefty baggage that colors everything they do. Temple could easily have turned Di into a one-note jealous rage-r but wisely gives her a softness when you least expect it. Equally thoughtful is Valverde’s effort as a not-so-helpless outsider that realizes too late that she’s treaded into a hornet’s nest. Cracks is one of those movies that most people will miss or skip and that’s a crime. While far from Oscar worthy, it’s a very fine first effort from a new generation of Scott filmmakers. I look forward to her future efforts – if they are all made as clever and engaging as this she’ll be making her own name for herself in Hollywood quite soon. Thoughts: I just….don’t know. I mean, it has all the elements to a movie that would be a sure thing for me but something just seems a tad off. I know that the TV series and subsequent movies and newer series are all very stylized — so in that respect I think that Tim Burton is an inspired choice as director. I’m also quite glad that he’s seemed to ditch his carnival of CGI for something a bit more old school Burton. I grow weary of the constant presence of Depp and Bonham Carter in all of Burton’s films and feel at this point all three need to seek different co-workers for the betterment of their own careers. Still…Pfeiffer looks wonderful and this may just have that 70’s kitsch vibe that is so hard to mimic convincingly. 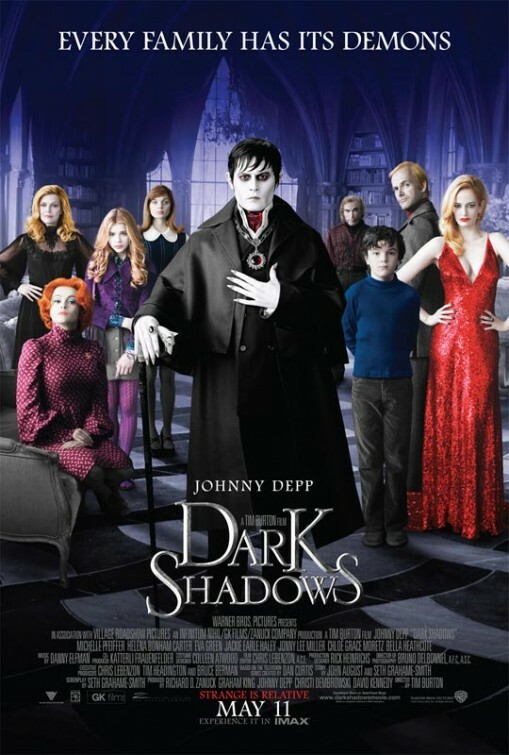 All in all, it has an interesting feel to it and here’s hoping the strange family of Barnabas Collins translates well to the big screen. 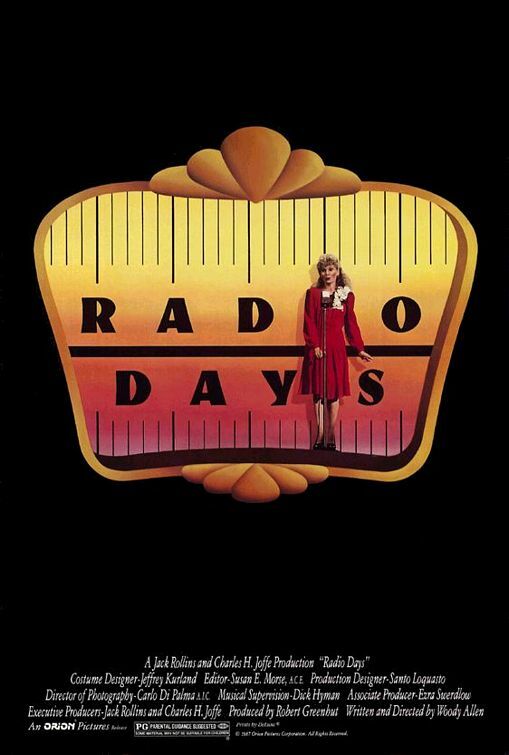 Synopsis: A nostalgic look at radio’s golden age focusing on one ordinary family and the various performers in the medium. Review: Like the Cohen Bros, Allen seems to churn out movies with regularity but with a certain ‘hit or miss’ quality for me. I think Allen of the 70’s was bit more successful but in the following decades he has had his share of good ideas that don’t necessarily make great movies. Radio Days catches Allen in a nice streak having just come off the great success of Hannah and Her Sisters. He’d follow this up with more somber fare for the next few years but what you get here is classic Allen in his best nostalgia mode. I’ve always responded best to Allen’s films that take place in the past with elements of his own up bringing and memories sprinkled around. Taking place in the early forties, Allen himself doesn’t appear in this one and lets Greene take on what has become known as the “Woody Allen role”. Even at eight, Greene displayed a knack for the brand of smug delivery he’s mine later in his career. As the youngest member of a large family that lives in the same apartment, the movie isn’t totally seen through his eyes but as more of an observance of how radio played an important part in his childhood. With Kavner and Tucker working well as Greene’s lovingly squabbling parents, Allen creates some nice moments of familial relations that are framework for telling fanciful stories relating to the ‘radio days’ and the era they existed in. Unfortunately, Allen was still with Farrow at this point and somehow felt the need to shoehorn a plot line for her that is totally separate from the central family that are infinitely more interesting than she is. As a ditzy cigarette girl and wannabe radio star, Farrow isn’t really to blame here. Her character is one part Lina Lamont from Singin’ in the Rain and two parts Olive Neal (Jennifer Tilly’s character from Bullets Over Broadway). It’s almost as if Allen had two scripts that he combined into one once he realized there wasn’t enough material for two different pictures. It’s too bad that he didn’t take the time to flesh out both so they were full pictures independently. Even with this strange juxtaposition of storylines, I found myself laughing a great deal and enjoying the ride back in time to a point in history where families ate their dinner to the sounds of big band music, women tuned in for radio dramas, and kids enjoyed the adventure heroes that always saved the day. I wouldn’t call this a minor Allen film – it’s absolutely worth the watch.